We are happy to return to the Herberger Theater for our 8th season. 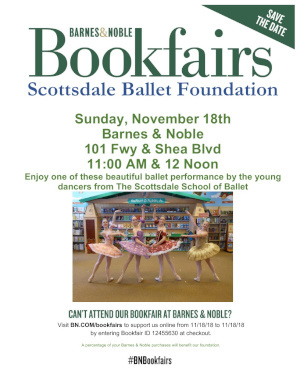 Our second program of this season is the annual “Soiree de Ballet 2017.” Sponsored by the Scottsdale Ballet Foundation. 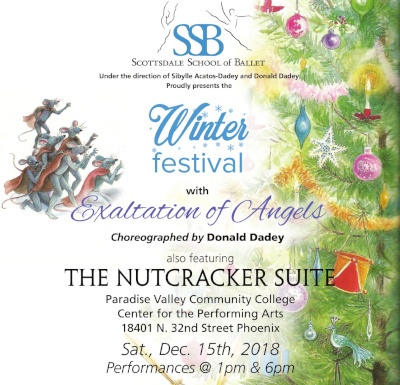 The evening features the perennial favorite, “The Ballet Class,” where the audience gets a look into the training of a ballet student, from the beginning steps through the Advanced level. Next for our original one-act ballet, we will present the rousing and rambunctious “The Carnival” conceived and choreographed by the directors Donald Dadey and Sibylle Acatos-Dadey. This fun and enjoyable look into a carnival is a must see for all ages! For the finale to this evening's performance, we present our highlights from the “Sleeping Beauty” ballet for the upper level students as our charming representation of a true classic. This ballet has been exquisitely restaged by Sibylle Acatos-Dadey. 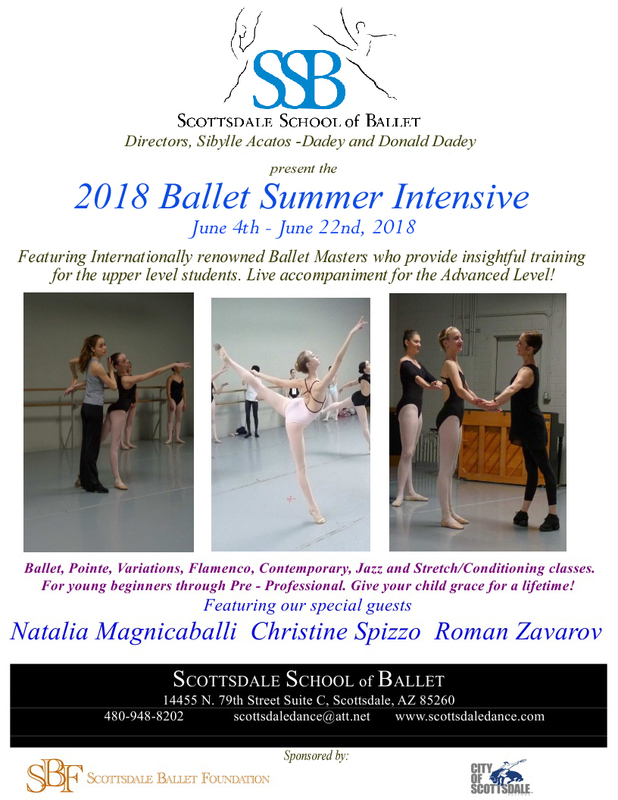 In addition to these wonderful ballets we are delighted to feature choreography from our wonderful faculty with Julia Chacon’s, Flamenco, and Cody Pickens, Contemporary Dance. 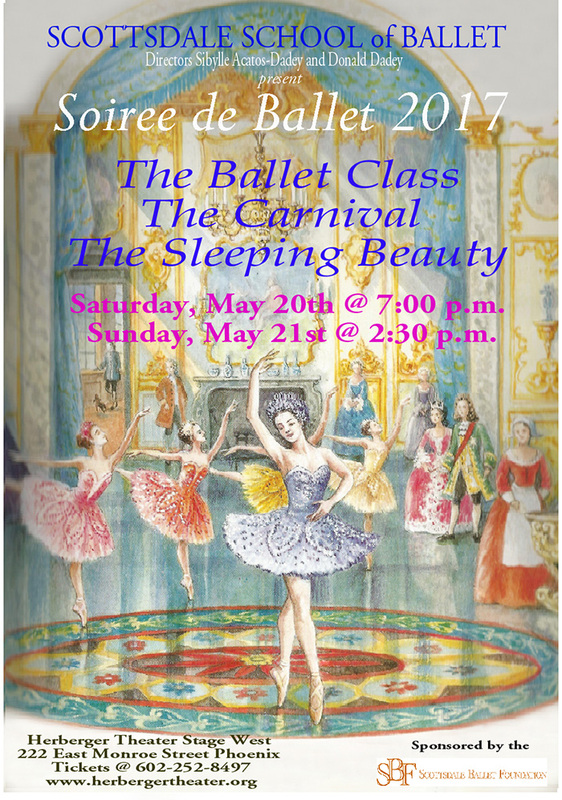 When: Saturday, May 20th 7:00 p.m. and Sunday, May 21st 2:30 p.m.